If you get a second, i posted a while back about an issue I'm having in 0017 where one card runs at 66% capacity while the others are at 100%. I'm just wondering if that's something you've seen before, and if there might be a straight forward solution to it. If not, I'll probably just wait until I swap boards in a few days to mess with it since otherwise it's running solid as a rock with all 6 gpus. Is the hashrate lower with the GPU running at 66%? With 1080 or 1080ti that is best; especially if they are AM models. I haven't heard of anyone needing to do this with 1070s or 1060s; what type of GPUs are you using? New setup splits the risers between the PSUs 2 go to separate lines on the EVGA, the other 3 on separate lines on the thermaltake, all on SATA power cables except 1 (though that shouldn't make a difference), and the risers are powered by the same PSU as the GPU main power is coming from whereas before they weren't. the mobo/cpu are still on the primary EVGA PSU, and the thermaltake is connected by a Y splitter ATX cable. The result is that the more even power load resolved the problem, though I can't be absolutely certain it was solved by splitting the risers to different lines exclusively. Also do you know which GPU model was the one that was insufficiently powered? I think driver 381.22 is installed right now. The cards that were underpowered were EVGA superclock 1070s, I had two of them on one SATA power cable and neither one worked properly that way. Once their risers were on their own lines they work great. Now I'm not seeing any dips in power - all cards are 100% and pulling about 3.25 sol / watt. How tricky would it be to use the nvidia-settings commands from within oneBash to run the following command recursively for each card that's detected when it runs, rather than setting a specific power limit or clock offset? I was going to rewrite exactly these parts of script since I also don't like such code. But before doing so I asked (in another rxOC thread) to put oneBash files to GitHub repository, so such changes will not be like a monkey work to copy/paste a lot. 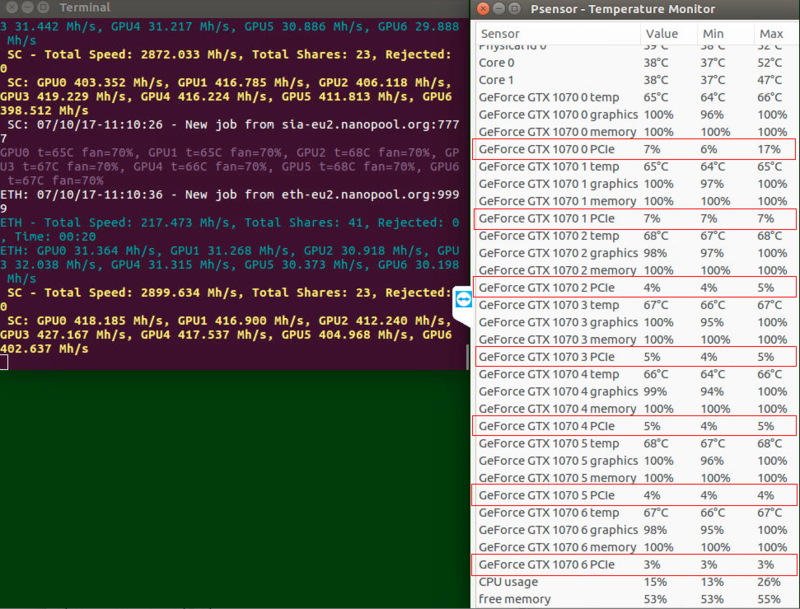 Until that I feel no motivation since I have only couple of rigs with 1050 running nvOC. It might change when I receive 12 PCIe MOBO (waiting for Biostar board from Aliexpress). But I am pretty sure that git is the best way to handle a lot of change requests and integrate them into this great distro or run just own branch. PS. I was talking about putting oneBash only to a repository, not about full distribution. Just tried nvOC v0017 on an ASROCK X370 Gaming K4 motherboard and it does not recognize the hardware. I don't have a x370 mobo and haven't added support for the chipset. continuously while booting (note holding it down doesn't usually work), then select boot in recovery mode. this should ensure your build has all known system files for your system. Will give that a shot tonight. Appreciate it! Have been testing the new Claymore 9.7 on a 6 x 1070 rig. It is absolutely faster than before, but have had hangups on a regular basis. Lowering MC helps, but the avg speed will be a bit lower than Genoil (running latest from github). You have to calculate it a bit, since the dual mining (DCRI 20) will give some additional value, but you'll lose 2% because of dev fee. The main advantage of Claymore is that it will restart itself, for Genoil you need to use a restart script. To me it seems Genoil is the better choice for now. 7 x 1070 rig here, i've found that if my clocks are even slightly too high it doesn't matter which miner i'm using the rig just hangs forever unless i restart it remotely via SSH, i'm using dcri 40 and i think its the best setting right now, its about 31.5Mh/s for ETH and 410 Mh/s for SIA, on claymore 9.5 it was more like 29.8/390..
Whats your power limit and clocks if you dont mind me asking? i'm on 125pl/0/1400. please help. How can i add dcri argument to my onebash settings? what and where exactly i should whrite? The dcri value is only for dual mining, if you're only mining Ethereum theres no point in using dcri, theres no point in even using claymore miner, genoil miner is just as fast but with no fee for strictly ETH mining. if you are dual mining just search for "dcri" in oneBash, the default setting is 70, i recommend changing it to 40. It's not set by default in oneBash So you can set it in $ETH_EXTENTION_ARGUMENTS. Use 40 or even 20 (depending your cards etc). 7 x 1070 rig here, i've found that if my clocks are even slightly too high it doesn't matter which miner i'm using the rig just hangs forever unless i restart it remotely via SSH, i'm using dcri 40 and i think its the best setting right now, its about 31.5Mh/s for ETH and 410 Mh/s for SIA, on claymore 9.5 it was , more like 29.8/390..
i see, i cant dual mine on anything less then 120 pl if i want the memory clocks to be 1000+ and still be stable. When dual mining it requires a lot more power, my dual mining rig I have to have minimum 120 watts. This is on Claymore 9.7. I uploaded the Newest oneBash and versions of additional files; including a new switch file that merges salfters changes with the implementation. I did a once over on the new switch / seemed good except for pascal which seemed to reinitialize everytime. I understood that you meant to add oneBash only for github. Look at the number of changes in this oneBash alone; and then consider how much more there would be to look at with input from even a few members. Until most of the features members want have a basic implementation; this is essentially only going to give me another thing I need to pay attention to. Granted if you have a suggestion, you can always make a post here like you did. I uploaded the Newest oneBash and versions of additional files; I added a GPUPowerMizerMode implementation. oneBash is not only an implementation; it is also a learning experience for many members. This is the primary reason I don't use loops / nested loops; everywhere I could. I will change them out eventually. Maybe the new driver pulls more power from the PCIe slot; I will have to test for this on more rigs. If it is the case; it will likely cause many previously stable 1070 rigs using 1x sata per every 2 GPUs to become unstable. Thanks! Will try with your power values. Seems that we need to have a conditional block with OC values depending on the mined coin and used miner in oneBash ..